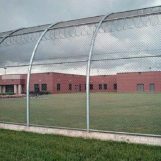 LARNED, Kan. (AP) — Twenty inmates at the Larned Correctional Mental Health Facility face felony charges after a riot at the prison in November. Pawnee County Attorney Doug McNett charged the inmates after a state prison official completed an investigation of the Nov. 6 uprising. McNett said in a news release Wednesday the 20 inmates were primarily responsible for the riots. He says he saw no evidence that inmates breached individual housing units in the prison’s Central Unit, and his office is treating the case as four self-contained riots occurring at the same time. State prison officials say Kansas spent $113,000 to repair damage and replace equipment. The Hutchinson News reports the inmates are charged with incitement to riot, criminal damage to property and rioting. The riot was one of several at Kansas prisons in 2017 and 2018.